NOTRE DAME Ind. (CNS) — Some University of Notre Dame students, faculty and alumni are voicing strong public criticism over the university administration’s decision to continue employee insurance coverage for sterilizations, contraceptives and abortifacients after a federal mandate to do so was amended late last year. On Oct. 6, President Donald Trump expanded the religious exemption for an Obama-era Health and Human Services directive requiring such coverage. The next day, the Notre Dame president, Holy Cross Father John Jenkins, joined other Catholic leaders in praising that action, and an Oct. 27 university email to employees stated that the previously mandated coverage would end Dec. 31. A small campus protest ensued over that announcement, organized by the Notre Dame Graduate Workers Collective, an independent group of graduate students. It is not clear how much such reaction influenced the Notre Dame administration, but the university reversed course. It informed employees Nov. 7 that third-party health plan administrator Meritain Health and prescription benefit manager OptumRx would continue to provide those items free of charge. Students also were informed that their coverage would continue. In that lawsuit, the university contended that the federal directive to provide insurance for morally objectionable items would harm the university’s Catholic character. Dissatisfied by the lack of a substantial explanation from the university administration about its about-face on the coverage, some faculty, students and alumni wrote to university leaders, asking them to reverse their decision to leave in place the insurance for immoral items and procedures. Some of those letters have been made public. A Nov. 29 letter to Father Jenkins from the executive board of the Notre Dame Chapter of University Faculty for Life was released Jan. 18, the day before Father Jenkins led the Notre Dame contingent at the annual March for Life in Washington. That letter had raised multiple questions and asked for a meeting with Father Jenkins. The group’s board explained that Father Jenkins had met with them and other concerned faculty and staff in December and had listened to them “respectfully,” but the policy had not changed, so the board decided to publish the letter in the “Viewpoint” section of the Jan. 18 issue of The Observer. A Dec. 4 open letter to the Notre Dame administration written by the editorial staff of the independent student publication Irish Rover took a similar approach, quoting extensively from a sworn affidavit that Notre Dame’s executive vice president, John Affleck-Graves, gave in the University of Notre Dame v. Burwell lawsuit. Among the Affleck-Graves affidavit statements the students cited was this: “It is Notre Dame’s sincerely held religious belief that it cannot become entangled with, or appear to facilitate, endorse, or accept, that which it believes to be contrary to Catholic faith. A Dec. 16 letter was sent to Father Jenkins and signed by lawyers who are Notre Dame alumni. To date, it has garnered 71 signatures. “Remedial action should be taken, an accounting given to the Notre Dame community, and thoughtful consideration given to how amends might be made to the courts,” they said. Browne, the university spokesman, told Catholic News Service that “Father Jenkins is currently reviewing Notre Dame policy on the issue and will have more to say on it soon.” He said the priest has been in discussion with, among others, Bishop Kevin C. Rhoades of Fort Wayne-South Bend. 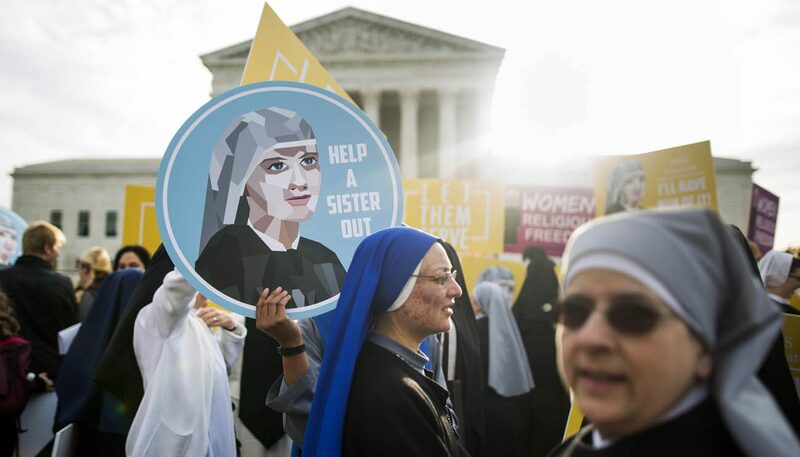 Browne said the university originally sued HHS in 2011 because the mandate “violated the Religious Freedom Restoration Act and the First Amendment,” thus opening the door for further government interference in Catholic institutions. In their Dec. 16 letter, the lawyers who are alumni said the “most obvious and effective” concrete measure to take “would be to exercise the right” the government gave the university to end the provision of abortifacients and contraceptives to students and employees, as you indicated initially you would do.